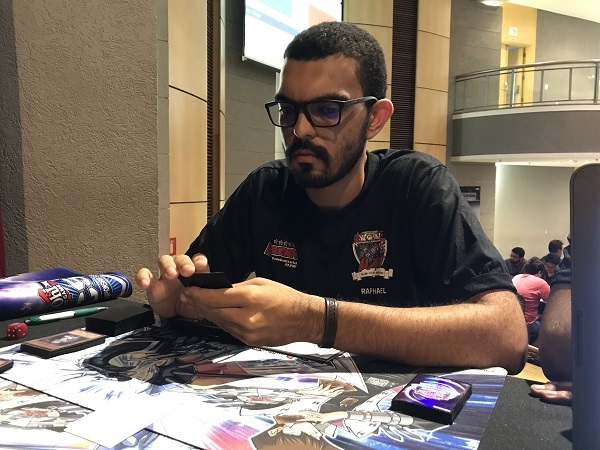 For Round 3, we’re looking at another one of our Bounty Duelists, Michael Verissimo Da Silva Luiz from Rio de Janeiro, Brazil taking on Raphael Carlos Rosa Pereira from Patos de Minas, Minas Gerais, Brazil. This matchup is Danger! Dark World vs. Thunder Dragons. Even though Summon Sorceress isn’t legal for play in South America, players outside of the United States have found a way to make the combo work without it. We’ll see it in action now! It’s time to Duel! Da Silva Luiz started off with Danger!? Tsuchinoko? and Rosa Pereira hit Broww, Huntsman of Dark World. Danger!? Tsuchinoko? was Summoned and he drew a card for the Danger effect and for Broww’s effect. Da Silva Luiz then used Danger! Chupacabra! which Rosa Pereira hit successfully. He then activated another Chupacabra, this time hitting Shaddoll Beast. Chupacabra hit the field, drawing a card plus another one for Beast’s effect. He then Normal Summoned Blackwing – Zephyros the Elite and used it and Chupacabra to Xyz Summon Outer Entity Nyarla then Xyz Summoned Outer Entity Azathot on top of it. Without having to worry about hand traps like Droll & Lock Bird or Ash Blossom & Joyous Spring, Da Silva Luiz then activated Card Destruction, discarding 2 cards and drawing 2 more, forcing Rosa Pereira to discard 5 to draw 5. He used the effect of Danger!? Jackelope? to Special Summon Danger! Dogman! from the Deck. He then activated Allure of Darkness, drawing 2 cards and banishing another Chupacabra. He then used Outer Entity Azathot, Danger!? Tsuchinoko? and Chupacabra to Link Summon Curious the Lightsworn Dominion whose effect let Da Silva Luiz send Cannon Soldier to the Graveyard. Curious’s other effect sent Broww, Huntsman of Dark World, Danger!? Tsuchinoko? and Danger! Nessie! to the Graveyard off the top of the Deck. Da Silva Luiz then activated The Beginning of the End, banishing 5 DARK monsters to draw 3 cards. He then activated Soul Charge, Special Summoning Danger! Nessie!, Cannon Soldier, Broww, Dogman and Chupacabra. He returned Chupacabra to his hand to Special Summon Zephyros form the Graveyard, taking 400 damage in the process, then returned Broww to Special Summon Grapha, Dragon Lord of Dark World from the Graveyard. Zehyros and Grapha were used to Link Summon Knightmare Phoenix, then Dogman and Nessie were used to Xyz Summon Number 42: Galaxy Tomahawk. Its effect was used to fill his field with Battle Eagle Tokens. Da Silva Luiz then used a Token and Curious the Lightsworn Dominion to Link Summon Firewall Dragon. Next, he used a Token to Link Summon Link Spider. Firewall Dragon’s effect left Da Silva Luiz Special Summon the Broww in his hand and from there, he started the burn combo that Rosa Pereira was unable to stop thanks to Outer Entity Azathot’s effect. Rosa Pereira elected to go first. he started with a Set backrow and passed. Rosa Pereira activated Gold Sarcophagus to banish Thunder Dragonroar whose effect Special Summon Thunder Dragondark. Next, he discarded Thunder Dragonhawk to Special Summon the banished Dragonroar then both monstrers were used to Link Summon Some Summer Summoner. Next, Dragondark’s effect let Rosa Pereira add Thunder Dragon Fusion from his Deck to his hand. Next, he activated one Thunder Dragon to search the second, then that one was discarded to add the third from his Deck to his hand. Next, he sent Some Summer Summoner to the Graveyard to Special Summon Thunder Dragon Colossus from his Extra Deck. Colossus attacked directlt. Da Silva Luiz drew Broww, Huntsman of Dark World. He Set a backrow and activated Chupacabra’s effect. Rosa Pereira hit it, and its Graveyard effect Special Summoned Danger! Mothman! from the Graveyard. Da Silva Luiz activated a second one and this one discarded Snoww, Unlight of Dark World. He drew a card for the effect and when Snoww activated Rosa Pereira chained Ghost Reaper & Winter Cherries and revealed Firewall to get a look at p1’s Extra Deck and banish Da Silva Luiz’s copy! (Snoww, Unlight of Dark World resolved anyway and Da Silva Luiz added a Dark World card from his Deck to his hand.) Da Silva Luiz then Normal Summoned Cannon Soldier and used Mothman, Chupacabra and Cannon Soldier to Link Summon Curious the Lightsworn Dominion. Da Silva Luiz activated Curious’s effect, sending Shaddoll Beast to the Graveyard. Next, Beast’s effect drew him a card while Curious’s effect sent Jackelope, Broww and Thunderbird to the Graveyard form the top of the Deck. Next, Da Silva Luiz activated the Set The Beginning of the End, banishing 5 DARK monsters to draw 3 cards. Next, Da Silva Luiz activated Dogman, with Rosa Pereira hitting Chupacabra. Dogman came to the field. Next, Bigfoot stomped in, but Rosa Pereira found it, so it was discarded. Another Bigfoot emerged, but the second copy was also hit out of the three cards left. In the Battle Phase, Curious the Lightsworn Dominion crashed into Thunder Dragon Colossus and Da Silva Luiz used Curious’s effect to add The Beginning of the End from the Graveyard back to his hand which was immediately activated in Main Phase 2 to banish 5 more monsters and draw 3 more. Next, Da Silva Luiz activated Dogman and Rosa Pereira hit Zephyros. Dogman hit the field and Da Silva Luiz drew a card. Next, the 2 Dogman were used to Xyz Summon Number 42: Galaxy Tomahawk whose effect let Da Silva Luiz fill his field with Tokens. Next, he used a Token and Number 42 to Link Summon Space Insulator. Next, he used another Token to Link Summon Link Spider, then used that Link Spider and another Token to Link Summon Knightmare Cerberus. He then activated Danger!? Tsuchinoko? with Rosa Pereira hitting Grinder Golem. Danger!? Tsuchinoko? hit the field but was immediately returned to his hand to Special Summon Zephyros form the Graveyard and took 400 damage. He then used Zephyros and Space Insulator to Link Summon Knightmare Unicorn. 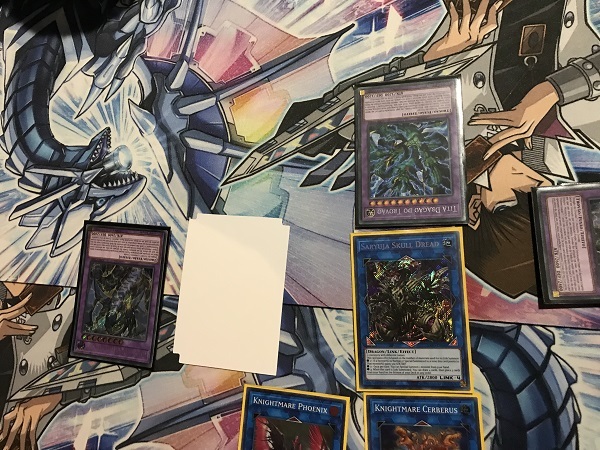 He activated Knightmare Unicorn’s effect, discarding Nessie to spin Colossus back to Rosa Pereira’s Extra Deck while also drawing a card. Nessie’s effect was used but Rosa Pereira hit it, sending the monster to the Graveyard. Nessie’s Graveyard effect added Danger! Dogman! from Da Silva Luiz’s Deck to his hand. Dogman’s effect was next, but Rosa Pereira hit that from Da Silva Luiz’s hand too. Next, Da Silva Luiz used Danger!? Tsuchinoko?’s effect but Rosa Pereira found a Danger!? Jackelope? instead. The snake hit the field and Jackelope’s effect Special Summoned another Nessie from the Deck in Defense Position. Next, Da Silva Luiz used Nessie, Knightmare Unicorn, a Token and Danger!? Tsuchinoko? to Link Summon Saryuja Skull Dread whose effect let Da Silva Luiz draw 4 cards and bottom-deck 3 cards from his hand. He then activated The Beginning of the End, banishing another 5 DARK monsters to draw 3 cards. He activated yet another The Beginning of the End, banishing another 5 DARK monsters to draw 3 cards. He Set one to the back, activated Nessie’s effect but hit a Broww instead. Nessie came to the field and Broww let Da Silva Luiz draw a card. Mothman’s effect was next, discarding Danger!? Tsuchinoko?. Mothman and Danger!? Tsuchinoko? came to the field. Nessie and Danger!? Tsuchinoko? were used to Link Summon Knightmare Phoenix, giving Da Silva Luiz a co-linked Knightmare Phoenix and Knightmare Cerberus, preventing his co-linked monsters from being destroyed by battle or card effects. Rosa Pereira was able to stop the combo but still had a field of Link Monsters to deal with. He activated Thunder Dragon Fusion, returning 2 Thunder Dragons and Thunder Dragonhawk to the Deck to Fusion Summon Thunder Dragon Titan. He put Titan in front of Saryuja Skull Dread to have Saryuja Skull Dread’s effect give Titan an additional 300 ATK. Next, he activated Thunder Dragon’s effect in his hand, activated Titan’s effect, trying to destroy itself which Rosa Pereira prevented by banishing a Thunder Dragonroar and a Thunder Dragondark from his Graveyard. Next, he used the effects of the Dragons to Special Summon Thunder Dragonmartix form the Deck and add Hawk from the Deck to his hand. Next, he activated Thunder Dragon from his hand, then used Titan’s effect. 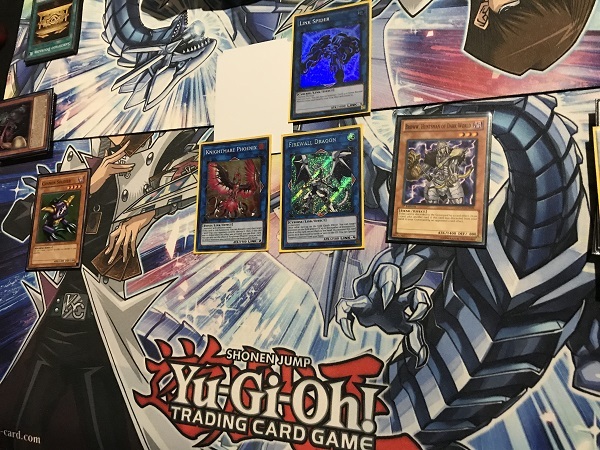 Some plays later, Thunder Dragon Titan and Thunder Dragonmatrix were used to Link Summon Some Summer Summoner then Rosa Pereira used Hawk’s effect form his hand to Special Summon the banished Thunder Dragonroar. He then sent Roar to the Graveyard to Special Summon Thunder Dragon Colossus then Special Summoned Titan by banishing Colossus from the field and a Thunder Dragon from his hand. Next, Some Summer Summoner was sent to the Graveyard to Special Summon Colossus. Titan attacked Knightmare Cerberus and Colossus attacked Knightmare Cerberus again (not destroyed because of the co-linked effect). Da Silva Luiz drew and was unable to deal with the field. He scooped and we’re going to the third Duel with less than 5 minutes left in the Round. Da Silva Luiz elected to go first. He started with Allure of Darkness, drawing 2 cards and banishing Zephyros. Rosa Pereira activated Droll & Lock Bird in response. Da Silva Luiz Normal Summoned Armageddon Knight and used its effect to send Cannon Soldier to the Graveyard. Next, he activated Mothman, with Rosa Pereira hitting Nessie. Mothman came to the field but no draw or search occurred thanks to Droll & Lock Bird. 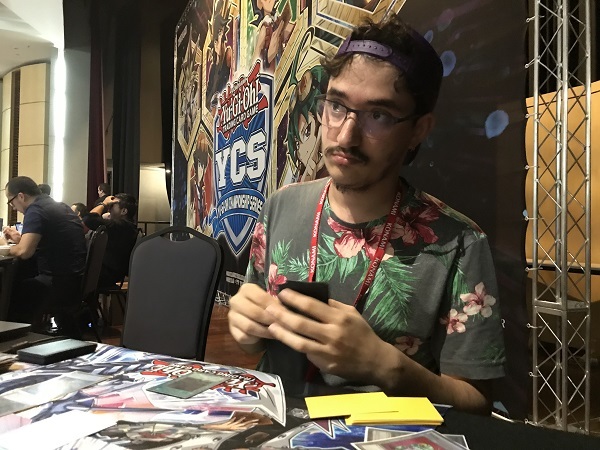 Da Silva Luiz used both monsters to Xyz Summon Abyss Dweller in an attempt to stop Rosa Pereira’s plays on the next turn, but time was called here. The Duel stood at 8000 LP each and there was no way for either player to deal damage during this phase, so the Duel ended in a draw, and with the match tied a one game each, the Match was a draw. Rosa Pereira fights back from not being able to play the first Duel to win the second game and force a draw by stopping the combo in the third Duel.